Hope this comes out clear enough. I don't know what your point is here. I drew this on Corel, took about 10 seconds. Where did the ordinate values come from? Were they "givens" from outside the lesson plan? But yours has a 50% high point. We need to be able to get the high point at 25-30%. It's a hobby, you can do it anyway you like. It is indeed a hobby, make it like you want. I was only demonstrating how easy it is to do with plain Jane vector file software. Do you like this one better? Yeah, not all of us are hooked in with drawing programs or drafting software. Or don't have printers. So we do it the old fashioned way--we earn it. Oops, I meant we draw it with a pencil. And then fudge it with a sanding block until it looks right. My latest has a semi-elliptical wing and tail. I-beamer. So far, so good. PS--Zaic loved his elliptical glider wings. If you have his Model Glider Design handbook, he shows the simple development of such a dual elliptical shape derived from a circle. It is what engineers and draftsmen called descriptive geometry. No math needed. PPS--What Paul was getting at is that the minor ellipse radius on the LE side should be, say 30%, and the TE side should be 70%, or Rm1+Rm2=chord; and Rm1=0.3*chord. So the overall wing shape is not formed by the equation of only one ellipse, but rather, is formed by splicing together two different ellipses. What you are showing in your second graphic appears to be a single ellipse with a major radius being 4x the minor radius, hence the 25% reference? If you don't have a CAD/Drawing program, one can draw an ellispe by hand the old fashioned way. Or you can use the old string and pin method. If at first you don't succeed ---- let someone else try it! I designed this wing because I can. There's everything in the drawing needed to build it also, AND it's in vector format for laser cutting all ribs. Don't like the tip, just cut it off a bit like the Shark. We just use a pencil . I like the grommet idea. Might really work good with a Pentel mechanical pencil. Suggest you consider Spectra line for the string as it is far less stretchy and would improve accuracy. 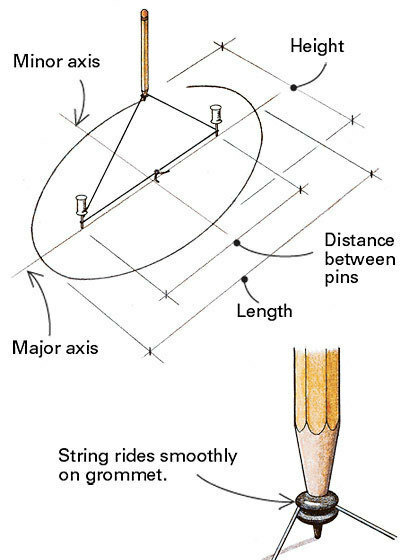 For those that would use this method, but want perhaps less trial and error, there are equations that go with the foci as to where you stick the pins. You can move the foci between drawing the LE and the TE in order to place the center of lift of each buttline on the spar at, say, 30%. I guarantee you, I did not use two pins and a piece of string to design my wing. And you would never build it either, so what does that prove? That you are good with an Etch-A Sketch? I see you're going to finally start building. Oh, I've built lots of stuff. Everything from free flight indoor rubber to R/C sail planes, to out door free flight and of course all sorts of control line models, stunt scale and speed. I've got a whole garage and basement full of airplanes, ask anyone that has been to my house. And you know what??? They all FLY!! And I try to fly all of them as much as possible where time and weather permit. I rather liked Larry Cunningham's elliptical wing designer spread sheet, but that's just me. Is the Cunningham spreadsheet around somewhere? Not sure anymore. I used to have a copy of it. May still on some backup somewhere. I'll take a look and post if I find it. It has been correctly observed that a true elliptical wing planform is not pleasing to the eye. Best results are obtained by designing "by eye". If a wing planform looks nice, it will work just fine. An elliptical wing is not the most efficient for models, so your home-brew wing shape will work about as well as one designed by computer or formula. Here is an example drawn "by eye". That's very nice but some events have a minimum wing area rule so the true ellipse can be measured and confirmed legal. root x span x .7854 = area. Personally I think the 30% high point ellipse looks very nice for speed and racing planes and it's a very good shape to prevent tip flex. Cut a piece of cardboard (from a box) 10" square. Weigh this. Now you know its weight per 100 square inches. Next, trace the wing panel on similar cardboard and cut it out. Weigh this. Divide this weight by the weight of the 100 square inch piece, and you get wing area in square inches! No math, and no formula. No math and no formulas, but off by a factor of 100, if performed as stated. And the result would be for a single panel, so double it. I designed my wing in CAD. I made a 1" square then linked a bunch together, building a grid that was large enough to cover half the wing. Took just a few minutes. I placed the wing half outline over the grid and counted the squares. Many squares were half or thirds so you have to keep track. If you add them all up carefully there could be accuracy. I don't remember what the total squares on my wing was but I have the file and could look it up. Also, a click and about a second or two, I could resize the wing to any span, larger or smaller. A decent CAD tool will calculate the area of any closed shape. No need to screw around with counting squares. Look in your manual for a function. Maybe it's not a decent CAD tool. Squares work for me and cardboard works for Floyd. Possibly. If it is AutoCAD or some standard tool (perhaps not a model airplane wing unique tool) then it should have an area function. Just like solid modeling tools (ProE, etc.) have automatic volume and mass properties functions. (Center of gravity, mass moments of inertia, etc.) And, another feature that is helpful with odd shaped wings is the centroid function. If you are actually designing an airplane instead of morphing from existing designs and counting on it working, you will need to find the MAC. A CAD tool is most helpful with the engineering tasks, and somewhat helpful with the drafting tasks. But if you put in a large amount of effort to design in 3-D, you get a lot of the "drafting" for free. Snap as many views as you want. Sections, too. So if "one potato, two potato" squares can work for you, and cardboard can work for Floyd, can we at least agree that formulas can work for Motorman, and two pins and a piece of string can work for someone else? I think Floyd just typo-ed. Multiply the ratio of the two weights by 100. That is, multiply the ratio of the wing pattern weight to the 100 in2 piece's weight by 100 in2. That is your wing area. Dave said the right thing, but I don't understand the "so double it" conclusion. You don't need to cut the basic piece to exactly 100 in2, although that makes a convenient number and final computation (find the ratio and move the decimal point two places to the right). Note: ratios mean divide the first (top) number by the second, written as a fraction. I could just have said, " 8 oz divided by 2 oz is 4. Then 4 x 150 = 600." You need to double the results of Floyd's method, because he said to trace a panel, which would be one half of the wing. If he had said trace the entire wing, then you wouldn't need to double it. Using a 10" x 10" sample is a good idea, because it is easier to achieve higher accuracy. But you have to get it back to the weight per unit area, which the prior instructions did not do. The reason the wording is important, and that this is not just nitpicking, is that the instructions are supposedly for someone who doesn't get the math. They want a cookbook recipe. So words have to be precise, unambiguous, and correct. For all the guys that can see they should or shouldn't multiply by 100 or by 2--they didn't need the instructions to begin with. My error. I had assumed that the reader had basic math skills, and would realize the "cardboard" method is a simple ratio formula. It converts ounces into an equivalent number in square inches. Of course, measuring just half od a wing panel means the final square inch number must be doubled! That beats doing the same measurement twice (and getting the same result). In case the symbol comes across looking strange on your computer, the value shown by Lauri is "pi" with a value of ~3.14. Ah, "panel." 'sorry. But whatever curved area you are trying to calculate, the method is pretty good. If you know it's a true elliptical chord distribution, then of course (pi)ab is the way to go.